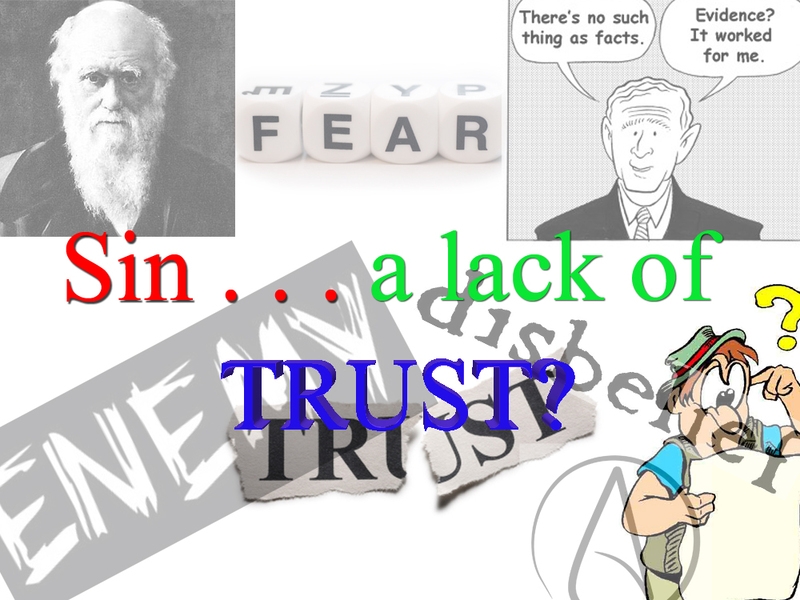 Sin = Lack of Trust?!? Part 2 in a series . . .
We went step by step through the verses and proved that the “original sin” was a lack of trust in Adonai – A lack of trust in Adonai’s commands and a lack of trust in Adonai’s warning of what would happen if those commands were broken. To be direct and to the point, a lack of trust in Adonai is to believe that Adonai is not faithful – that Adonai is not truthful – that Adonai can not be trusted – that Adonai lies. or a mortal who changes his mind. when he makes a promise, he will fulfill it. The text backs this up in the Brit Chadashah (New Covenant – New Testament). and you want to carry out your father’s desires. because there is no truth in him. indeed, the inventor of the lie! To doubt Adonai who is the author of truth, is to believe that Adonai lies. There is no lie in Adonai. To believe that Adonai lies is to believe the “inventor of the lie” OVER Adonai. The ORIGINAL SIN was believing the serpent’s lie over God’s truth! I am a believer . . . I think this or that or I do this or that . . . Therefore, regardless of what the text says, I am NOT in error. This is such a dangerous way to approach God’s word! I see this everyday. I talk to people everyday that call themselves believers and take some form of this approach to God’s word. Some of this is due to ignorance of what the text is and/and its purpose. Some of this is due to pride, and as the text tells us, pride leads to hell. God’s warning and God’s truth. Do you believe it? Or are you going to believe the lie that the inventor of lies presents in opposition to it? This is why doubt is the enemy of the gospel. belief, certainty, confidence, dependence, reliance. The list is much longer and there are many more than these. Brothers and sisters, you are a reflection of the light that is our Lord. When you reflect doubt, do you reflect our Lord accurately? When you show confusion, disbelief, distrust, fear, skepticism . . . how does this portray our Lord? Do you not pervert him? How does this reflect his glory? Just because you are a believer that has doubts does not mean that doubt is okay and that you are not in error. for the doubter is like a wave in the sea being tossed and driven by the wind. 7 Indeed that person should not think that he will receive anything from the Lord, 8 because he is double-minded, unstable in all his ways. The word for nothing in the Greek is μηδείς mēdeis and in almost all uses is used as an absolute. Double-minded is the Greek word δίψυχος dipsuchos. Dipsuchos, meaning “two souls,” is a figurative expression for indecision or wavering (cf. diakrinō , which parallels dipsuchos in James 1:8; 4:8, the “double-minded” man). It implies doubt. Thoralf Gilbrant, ed., “1368. δίψυχος,” in The Complete Biblical Library Greek-English Dictionary – Delta-Epsilon, (Springfield, MO: Complete Biblical Library, 1991), WORDsearch CROSS e-book, Under: “1368. Î´á½·ÏˆÏ…Ï‡Î¿Ï‚”. The Greek word for unstable is ἀκατάστατος akatastatos. Liddell-Scott also suggests the definition “fickle” for this term which gives a negative image of the restless person. This person is considered to be one who wavers or is variable in his mind, his will, or his emotions. Demosthenes, an early Greek writer, used akatastatos as a description of the Greek democracy because of its unreliable, wavering policies (De Falsa Legatione 19.136). . .
James suggested that a doubting man is unstable or restless in all areas of his life. Thoralf Gilbrant, ed., “180. ἀκατάστατος,” in The Complete Biblical Library Greek-English Dictionary – Alpha-Gamma, (Springfield, MO: Complete Biblical Library, 1991), WORDsearch CROSS e-book, Under: “180. á¼€ÎºÎ±Ï„á½±ÏƒÏ„Î±Ï„Î¿Ï‚”. We are going to look as some more verses in the text on Trust vs Doubt. 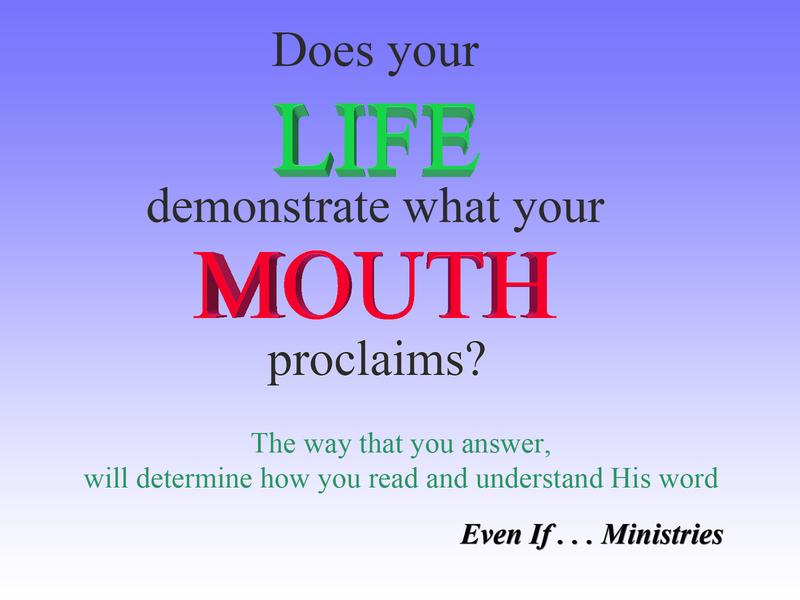 You see, in reality, it really doesn’t matter what I think or what you think – all that matters is what He says! What He says is the ONLY thing worth believing – the only thing that is truly trustworthy! “Don’t be afraid, Z’kharyah; because your prayer has been heard. even from his mother’s womb. “How can I be sure of this? “and I stand in the presence of God. I was sent to speak to you, to give you this good news. You see, Z’kharyah doubted and as a punishment for that doubt, he was made mute for the entire pregnancy. The text tells us that Adonai disciplines those He loves. Z’kharyah was just one example of many of those disciplined by a loving father for having doubt. Why?!? Because anything not based on trust is sin and it is sin that separates us from God! anything based on DOUBT is a sin . . .
Romans 14:23 (CJB) 23 But the doubter comes under condemnation if he eats, because his action is not based on trust. And anything not based on trust is a sin. Romans 14:23 (NIV) 23 But the man who has doubts is condemned if he eats, because his eating is not from faith; and everything that does not come from faith is sin. Romans 14:23 (HCSB) 23 But whoever doubts stands condemned if he eats, because his eating is not from a conviction, and everything that is not from a conviction is sin. Romans 14:23 (AMP) 23 But the man who has doubts (misgivings, an uneasy conscience) about eating, and then eats [perhaps because of you], stands condemned [before God], because he is not true to his convictions and he does not act from faith. For whatever does not originate and proceed from faith is sin [whatever is done without a conviction of its approval by God is sinful]. Romans 14:23 (KJV) 23 And he that doubteth is damned if he eat, because he eateth not of faith: for whatsoever is not of faith is sin. Romans 14:23 (NASB) 23 But he who doubts is condemned if he eats, because his eating is not from faith; and whatever is not from faith is sin. your sins have hidden his face from you, so that he doesn’t hear. Doubt is a sin and and that alone makes it an enemy of the Gospel which is a message of trust in the one that God sent Yeshua HaMashiach (Jesus the Christ). This entry was posted in Living life Even if . . ., Word Studies and tagged abort, abortion, akatastatos, ἀκατάστατος, dipsuchos, DOUBT, Genesis 3, Holy Spirit, Isaiah 59:2, δίψυχος, μηδείς, James 1, Jesus the Christ, John 8, lie, mēdeis, Numbers 23, ORIGINAL Sin, Romans 14:23, ruach hakodesh, sin, trust, Yeshua HaMashiach, Z'kharyah, Zechariah. Bookmark the permalink. 5 Responses to Sin = Lack of Trust?!? Part 2 in a series . . . Wish I could highlight the parts and words that I especially like and would like to shout out to the world!!!! An yet that is exactly what we are called to do!!! Shout it from the rooftops and spread the Good News Sister – He is an amazing God!!! I will share a weakness with you regarding my own lack of trust – it is not in His word failing or His promises failing – my fear is that in building my character, that He will allow me to be uncomfortable – maybe even physically suffer – – when I think about believers in other countries suffering for Messiah, I realize that I have a long, long way to go. ditto my son……..I totally understand what you’re saying…..I also have a lonnnnnng way to go.